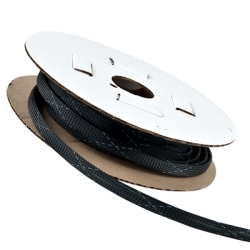 1/2" XPF Expandable Sleeving | U.S. Plastic Corp.
Lightweight, self-fitting, monofilament sleeving designed to encapsulate and protect cable bundles and wire assemblies. These expandable sleevings adjust to irregular surfaces and contours, providing abrasion resistance and protection with a minimum of bulk and weight. Flame retardant. Operating temps. -94° to 250°F. Sold in full spools only.